You all know how much we love Caprese over here! I mean, what’s not to love? 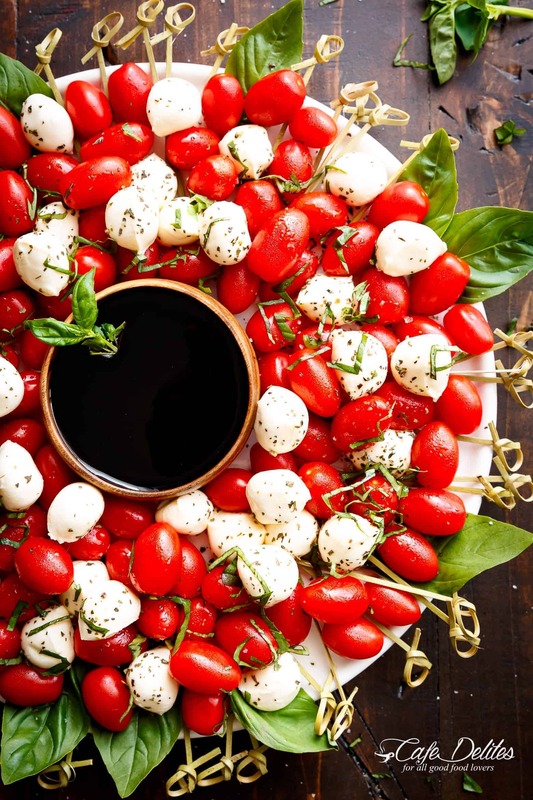 Fresh and juicy grape tomatoes, creamy fresh mozzarella, and fresh basil leaves are dressed with olive oil and Italian herbs! 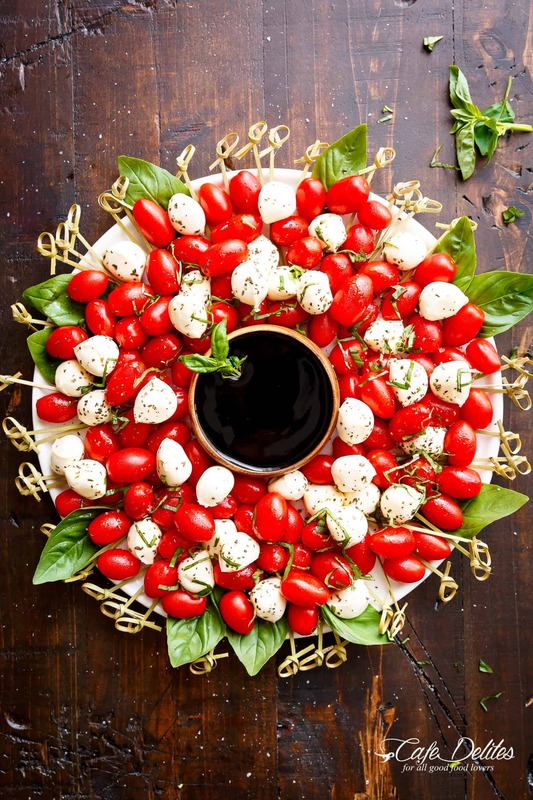 A combination PERFECT for a Caprese Christmas Wreath! Load it all up with toothpicks for easy picking or skewering while adding to a ‘wreath’ design, and watch their faces as they enjoy every piece of this appetizer. This Caprese Christmas Wreath was a joy to make, a joy to eat, and a joy to look at. Just 10 minutes to a silky, smooth balsamic glaze, OR use store bought and make your salad in less than 5 minutes! HOW TO MAKE A CAPRESE WREATH! We use grape tomatoes for this one, but you can use cherry tomatoes. 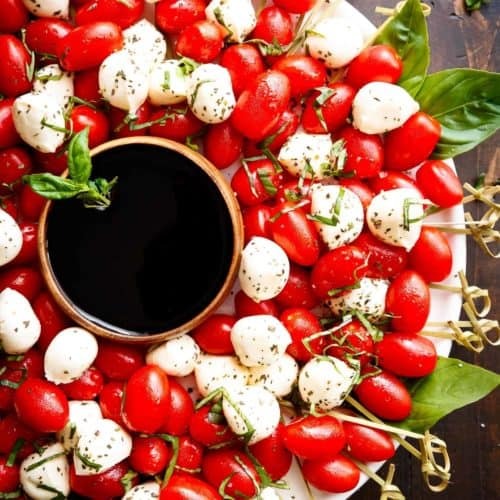 Grab a serving platter and arrange the tomatoes and fresh mozzarella balls around the rim of the platter. 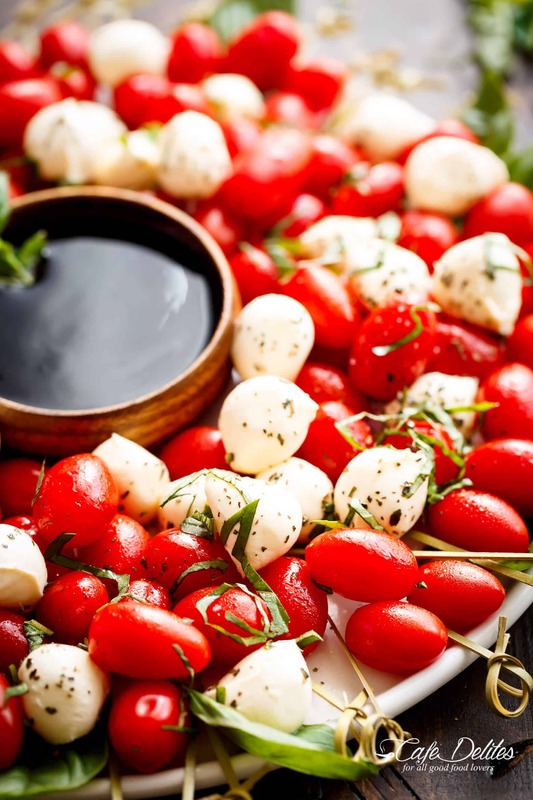 Try to get mozzarella balls the same size as the tomatoes for a great visual effect. Drizzle the edible Christmas wreath olive oil and season with Italian herbs, salt and pepper. Toss the tomatoes and cheese balls through the oil with a spoon. Garnish with the fresh shredded basil and arrange whole basil leaves around the platter for decoration. Use store bought balsamic glaze or use our homemade recipe! When ready to serve your Christmas wreath, place a bowl of balsamic glaze in the centre of the wreath. Arrange toothpicks around and underneath the tomato and cheese balls, with the sharp ends toward the middle of the plate for easy entertaining! For more Caprese, try this Balsamic Glazed Caprese Chicken! Or this Grilled Avocado Caprese Crostini! Need more Christmas Ideas? Try these recipes! Combine the vinegar and sugar in a small saucepan. Cook while stirring over low heat for 4-5 minutes, or until sugar has dissolved. Increase heat to medium setting and bring to a boil. Reduce heat to low and allow to simmer for 8-10 minutes, or until reduced by one-third and thickened like syrup. Wash and dry the tomatoes. Arrange them in a circle on a large serving plate or round platter. Drain the mozzarella balls and arrange between the tomatoes. Drizzle with olive oil and season with the Italian herbs, salt and pepper. 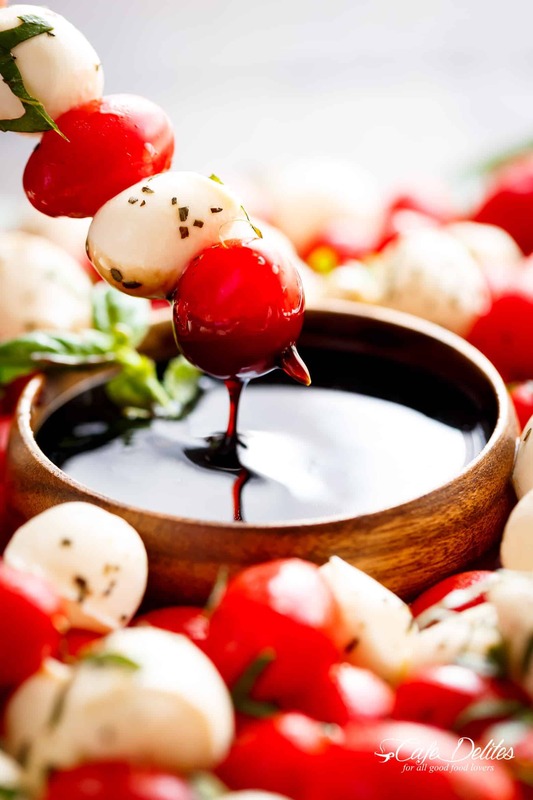 Toss the tomatoes and bocconcini through the oil with a spoon. Garnish with the fresh shredded basil. To serve, place the bowl of balsamic glaze in the centre of the wreath. Arrange toothpicks around and underneath the tomato and cheese balls, with the sharp ends toward the middle of the plate. See instruction #2. Please confirm if the tomatoes/cheese are tossed with the oli/herbs AFTER they are arranged like a wreath on the serving plate??? This looks both beautiful and delicious! Can this be prepared in advance and if so will it keep in the fridge and for how long? It really is so good. Yes you can prepare in advance but only for one day or less and make sure to refrigerate. Please let me know how its received. Thanks for following along with me!! My neighbor brought this to a party once and we all loved them but I never found out what the sauce was. Thank you for sharing. I will love having these for New Years Eve. I feel stupid for asking – for the dried italian herbs, do you mean the italian seasoning that can be bought in the spice section? What size platter did you serve this on? Darylann 40cm or 15 inches. I made the capers salad Christmas wreath yesterday for a party. It’s fabulous! My balsamic glaze did not get thick, so I added she me Karl syrup.